South Bay café an offshoot of popular Israeli falafel spot – J. Building on the success of their first Bay Area venture, Falafel Stop in Sunnyvale, owners Jonathan and Michal Laor just opened Café Stop right next door at 1323 Sunnyvale-Saratoga Road. The two share a parking lot where cars block in other cars, which is a bit crazy-making; the jostling for space can make you feel like you’re in Tel Aviv before even getting inside to order. The Organic Epicure took an Israeli friend to try the new place. Like Falafel Stop, Café Stop has counter service. There are a few tables inside, but most are set on a spacious patio, some of it covered and some open (seating at Falafel Stop is at picnic tables inside a closed tent). Café Stop is in soft opening indefinitely; current hours are 8 a.m. to 4 p.m. daily. Laor said he plans to expand the vegetarian offerings in the coming months and eventually will stay open until midnight every day. Falafel Stop, which opened in 2012, made a name for itself by importing pita dough from Israel and baking it on the premises; falafel and hummus are on the menu as well as shwarma and other grilled meats. 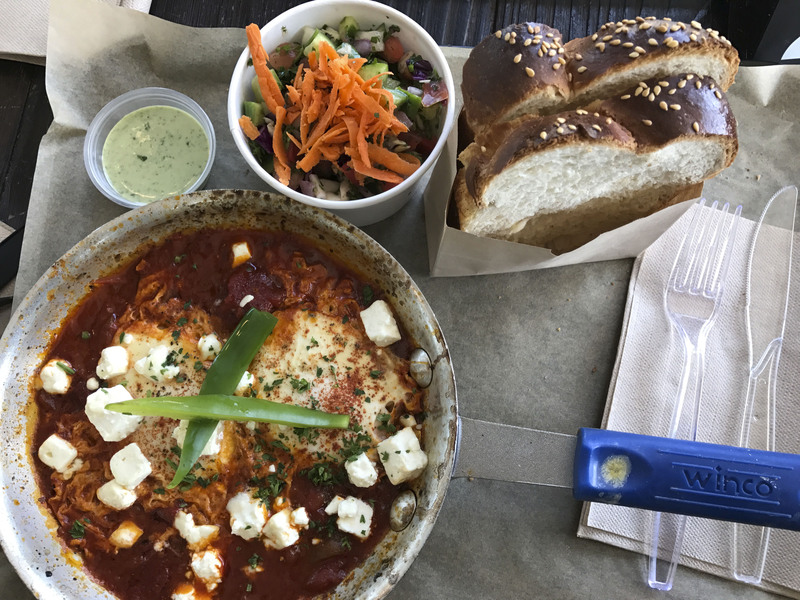 While there’s a bit of overlap (both places offer shakshouka), Café Stop is more of an Israeli café, with coffee drinks, egg dishes and baked goods. Sandwiches include chicken schnitzel, Jerusalem sesame bagel with melted cheese and a tuna melt and burger. Of course, Israeli salad is on the menu. And there are non-Israeli items, too, such as pasta. Like the pita next door, all of the pastries and breads are imported from Israel in dough form. They are made with strictly kosher ingredients and freshly baked on site. But the restaurant itself is not kosher because it’s open on Shabbat, and ingredients used in other dishes are not necessarily kosher. Judging by the amount of Hebrew heard there on our visit, it’s already a draw for the large number of Israelis in the area. But we were told that Falafel Stop also has been very popular with the Indian nationals who populate Silicon Valley because of its plentiful vegetarian options. We ordered the shakshouka, the Jerusalem sesame bagel and the enormous Turkish boreka filled with spinach and feta. It was oblong and served with a sliced hard-boiled egg for diners who like to add egg slices inside. Accompaniments included Israeli pickles and a trio of sauces: tomato purée, green tahini and red z’hug. While we usually love z’hug, we found this one to be overwhelmingly hot, with none of the subtlety of herbs it also can have. But the boreka was perfectly flaky with a well-seasoned filling. The shakshouka came in its own skillet with a side of Israeli salad and challah, light and puffy, the perfect vehicle for soaking up the tomato, pepper and onion sauce (though we would have preferred it a bit spicier.) Feta can be added to the dish, something we wholeheartedly recommend. Our favorite was the Jerusalem sesame bagel, which was grilled with feta, cheddar and tomato; the bagel was soft and chewy and tasted just like the ones in Israel (for those unfamiliar with the Jerusalem bagel, it is larger and softer than its American counterpart). It’s hard to improve on a grilled cheese sandwich, but this one managed to. The coffee is from Italy, and there’s quite a large selection of pastries to go with it: several kinds of strudel (halva, chocolate, apple), croissants, babka and breads. We couldn’t try them all, but of those we tasted, the chocolate strudel was our favorite. The pastry dough for the strudel was most likely the same puff pastry used for the borekas, but it’s delicious, so no complaints. As for expanding Falafel Stop throughout the Bay Area, the Laors had their sights set on Oakland, where a second location was in the works on Lakeshore Avenue. While construction was already finished and things were moving along, Laor got an offer he couldn’t refuse from Peet’s Coffee, located next door, which was looking to expand. Laor said he is eyeing spots in Walnut Creek and San Francisco for new locations of Falafel Stop. “It’s a concept that is popular and can easily be expanded,” he said. With many Israelis calling it their favorite falafel place in the Bay Area, the expansion plans are good news. Watch this space for updates about future locations.